How Are Shopify Product Inputs Synced with Modalyst Items? 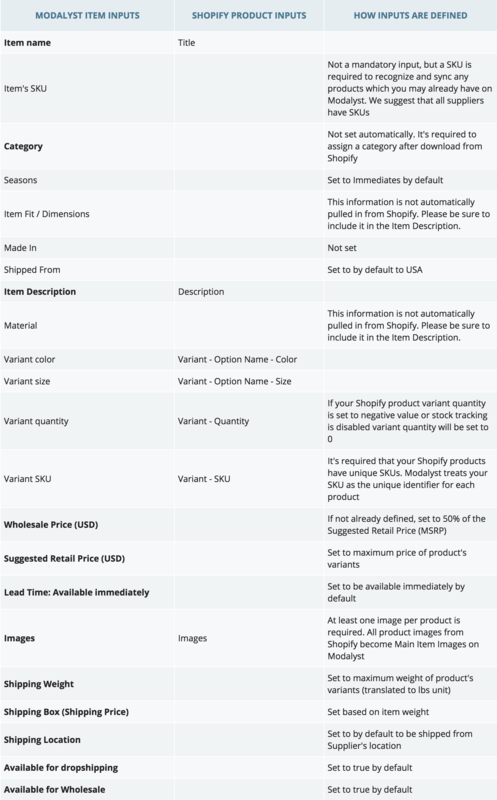 The table below shows how Shopify Product inputs are synced with Modalyst Items. Modalyst pulls the stated inputs from Products within Shopify on a per product basis. Product info from Shopify flows into the stated inputs on Modalyst. This column states how information is pulled from Shopify and translated onto Modalyst. In most cases, the products will sync seamlessly. If, for any reason, there is an issue, please review the unable to sink question for more information. Once that information is corrected in Shopify, the items will be uploaded and synced onto Modalyst. All mandatory inputs must be present before an item can be published and available for dropshipping.